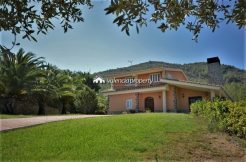 4 bedroom detached villa, pool and attic. Located in the municipality of Rogtlá, in the region of La Costera, near the city of Xativa. 9284 sqm plot, located high on a hill, from which the whole valley and the surrounding area is displayed. Access from the A-7 is simple and is done by paved road down to the front door of the property. Entire perimeter is fenced. The villa, occupies the highest part of the plot area. 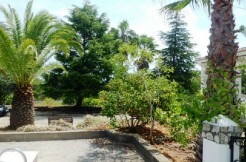 At its entrance, it has a large parking area and a large garden areas surrounding the East and South. It is extending southwards, as far as the eye can see, planting orange trees. To the west, an enclosure with a set that form: the pool, the bar, and two pergolas to give two different environments. The usable area of the house is 160 sqm, with a covered surface of 293 sqm. It is distributed in main floor, basement and attic. On the main floor it has 3 bedrooms, lounge, open kitchen, 2 bathrooms. Porch and garage with terrace. In the basement has a room as a workshop, a warehouse and a fourth guest bedroom. Toilet. Next to the basement is the house of the treatment plant where it acts on the operation of the filter system of the pool and the keys to water independently different areas of irrigation of the plot. A property that has been in a continuous process of improvement over recent years and the price, however, has been having to adapt to market conditions. Its owners are aware of this fact but, even so, have always considered the possible interested in this property appreciate all the improvements that make this property one of the best choices for their high ratio between price and quality. In addition, it favored by an excellent presentation with a few details that will surprise you.